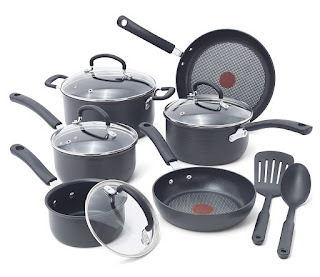 Loving this T-Fal Scratch Resistant Titanium Nonstick Thermo-Spot Heat Indicator Cookware Set - 12 Piece ONLY $59.49 (Retail $98.37). Riveted silicone handles for safety and comfort.This cookware set is that it is not recommended for use with an induction stove. I have one of these skillets and LOVE it! Browse more HOT deal on Tfal HERE.